We hung out at The Bronx Zoo on the weekend, an amazingly wooded retreat we all love to visit. 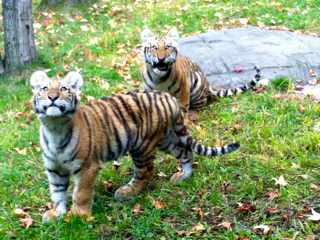 The Siberian tiger cubs, about a month and a half old, were awesome. The line to get onto the Wild Asia Monorail was seriously long. We waited a bit, but Max started shrieking because he was freaked by the crowds. So Dave asked the attendant if we could move up and she let us. I had no problem with asking because the alternative was for us all to leave. Max kept on wailing, but we knew he'd like he ride once he was on it. A few minutes later, a train came in. Max has a thing about sitting in corners and last cars—it's comforting to him. And sure enough, he wanted to go in the last car. We didn't have that choice, so Dave toted him into the car directly in front of us, which made Max extra upset. As the ride started, Max was half-standing between Dave's knees, holding onto the railing and crying. I sat in the back with Sabrina. Tour guide: "Everyone must be seated. Are you listening, Car Number Three?" I peered down the line of cars. I didn't notice anyone standing. The train went on and Max calmed down. We saw a red panda, a great big hippo, a herd of antelope. 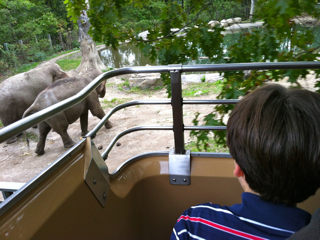 The elephants pooped right as we passed, which Max seriously enjoyed. "Rules are not made to be broken, Car Number Three. Everyone must be seated," said the tour guide, and the train came to a stop. This time, Dave yanked Max down. Oh. Car Number Three. Us. The guide had every right to be stern. Last month, an emotionally disturbed guy jumped off the train into the tiger den. He wanted to be "one with" the tiger. I used to be a law-abiding citizen. Then I had a child with special needs. And while Max hasn't exactly made me resort to a life of crime, I do on occasion bend rules. It's called survival of the sanest, because this is what we need to do so our family can actually enjoy things. The train glided on. Suddenly, Max was pointing toward me. He wanted to sit in the back row. "No, Max, we can't stand again," I said. "It's a train. We're not allowed to stand." He started tearing up, and shaking his head at the river we were about to cross. Max freaks out about bridges, and I realized he was getting scared. "Quick! Switch!" I said to Dave, and he helped Max to the back so I could grab him as Sabrina zoomed to the front. Max pointed to Dave. He wanted him in the back with him, not me. I glanced at the guide, who was eyeing us warily in the rearview mirror. "Quick! Switch!" I said, and we did. I was starting to feel like a quick-change-artist circus act. Tour guide: "I don't know WHAT is up with Car Number Three!" I felt sheepish. But there was nothing I could do except sit back and enjoy the rest of the ride. And I did. Love this. Been there a million times but reading it will have me laughing all day long. I would've had a word with the tour guide afterward - not a mean one, just an apology & brief explanation, that you weren't just being crazy, rude people. I am laughing and crying reading this because, with two kids on the autism spectrum, I am usually THAT car! And this Sunday I was THAT church pew. God bless you and Max! Yup, been there, done that. Bending the rules so my kids will not be tortured and can fully participate in life. Loved your tale of it. Hey maybe you should start a club called "Car Number 3" I'd be there with you! Thanks for the smiles! J loves the local zoo here and our zoo experiences often have me blocking out space in front of J's wheelchair to provide an unobstructed view or telling J in a voice a touch louder than necessary that we need to be patient and wait for s spot to open up big enough to accommodate J's wheelchair. I am often THAT dad. Oh Ellen, I can so relate to this one! We are ALWAYS car 3. And I so wish that zoo was nearer to me! One train obsessed boy and another in love with wild animals. Would be a day out in heaven for my family :). Oh man.... I feel for you. And I'm also inspired by your forthright action and just going ahead doing what you need to, so that your family can also have a good time. I was googling "yoda" yesterday (yeah, that's the kind of stuff I do in my spare time!) and came upon a photo of Sabrina and was all, "whaaat? I KNOW THAT GIRL!" - it was from your trip to the zoo-esque place and there was a frog that looked like yoda! I am so laughing right now ... because this is my life. For someone that used to me Miss Goodie Two Shoes, I now live a life of crime. Last week we went to Sea World Homeschool Day. They wanted all of us in the same stadium for lunch. It was not going to happen. We got dirty looks because we sat on the curb instead. I just smiled back. Oh Ellen I really enjoyed reading this post! You guys have it down to an art! To get Max to ride a roller coaster, say that it's like a train but really fast.